Since last year, the high esteemed book fair in Frankfurt has become a great opportunity for self-publishers to promote projects, network internationally and educate. We provide an overview of the essential information and numerous tips, how you get the best out of visiting a book fair. Three self-publishers can present their projects and marketing concepts at the Self-Publishing Stage on Sunday at 13:15. Experts will give professional feedback and tips. Even for the audience, this event is a great opportunity to learn new marketing strategies and to talk with fellow authors and industry professionals. Apply here with this form. The eBook Gallery presents self-published works on tablets and eReaders accompanied with informative set cards. Apply up to four titles for 92.01 EUR with this form. Tip: Let your readers and author colleagues know when you will be there. The best time is the weekend (Oct. 10-12), because the fair is open for all visitors then. Use the campaign “Wir sind hier” and upload your profile! Most fairs and conferences provide a program of educational events. At the FBF, the Publishing Perspective Stage (Hall 8.0) offer a top-class panels in English, to name one: Alison Baverstock on Self-Publishing Process: Step-By-Step Best Practices on Saturday at 10:30am. The speeches on Saturday are free and the Add-On Ticket for the workshops on Friday costs 94.01 EUR. Here you find the whole program in English. That’s not enough? The new and more exclusive Business Club offers a extensive program full with exquisite events and panels. This excellency has its price and the Business Club Ticket costs 583.10 EUR per day and 1178.10 EUR for the whole week. These days, important representatives of the international book industry will gather in Frankfurt. Therefore, this is the best opportunity to network with relevant people. Where you can meet them? It is not easy to have a quiet and effective talk with agents, publishers or editors on the fair; they are on a tight schedule and fix their meetings months in advance. How you can “catch” them? Address them directly after their panel discussions. However, prepare for a very short talk: Note precise questions, get to the point immediately, and have your business card and a snippet of your manuscript ready. Use Author-Badges and the ID-Wall (available at the Self-Publishing Area in hall 3.1) to let others know you are here and to meet others. Every evening at 5pm, there is the Meet & Greet at the Self-Publishing Stage, where you can connect with service providers or other authors. This is also the perfect possibility to arrange meetings with your German fans. Tip: Focus not only the Self-Publishing and International Areas. There is also a great Illustrator Corner for instance. Do not underestimate the various impressions you can gain as a self-publisher from fairs like this: They range from innovative marketing-strategies to the trends of new releases. Experiencing the flair of a book fair is fun and motivates for your new projects. Tip: To maximize the effect of your visit, announce it in advance and share your unique moments via your blog, Facebook or Twitter. Post a selfie with your set card or your fans for example! Are you looking for a publisher? Do you want to educate yourself? Or do you want to connect with (new) readers? Your goal is fixed, than ask yourself: Where and how are you going to achieve this goal? When and where are you going to meet this people? And do you need a fixed appointment? 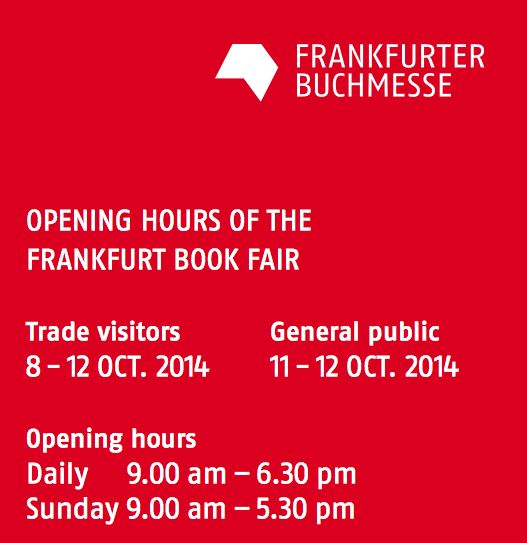 The Frankfurt Book Fair offers an Online Catalogue with all exhibitors. Use the immense range of events! Define the topics of your interest and weaknesses you want to improve and search for specific panels and workshops in the Event Calendar. Download your personal schedule as PDF. 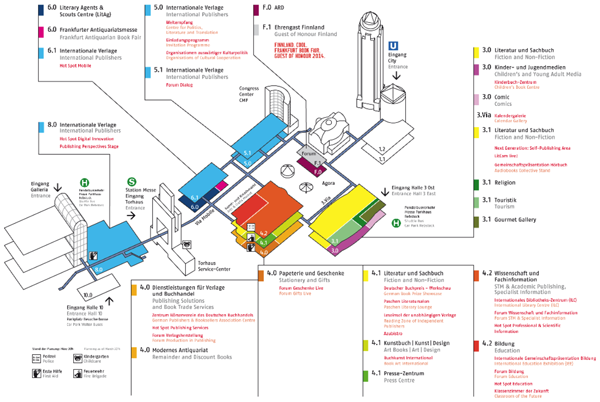 Keep in mind that if the events are not in the same hall it can take you sometimes more than 15 minutes to get there despite of shuttle-busses. You are going to meet your readers or network with important people, so invest in high quality business cards, flyers to your book or small give-aways to stay in their mind. therefore, the most precious tip from experienced fair visitors is this one: Wear comfortable shoes and leave your unworn, shiny ones at home! As a self-publisher you can buy tickets for professional visitors. The ticket of the advance sale costs 36.00 EUR (instead of 52.00 EUR) for one day and 72.00 EUR (104.00 EUR) for the whole five days. The Add-On-Ticket for the English conference on Friday costs 94,01 EUR and as a package with the five days 153.51 EUR. Save 10% and use our voucher-code “SelfPublishing14Discount”! Here are the details on registration and tickets. We wish you lots of success on this year’s Frankfurt Book Fair or any other fair – and would be very happy, if you share your experiences with us in the comments! Dear XinXii…the post Do you have writing talent? You are getting Better and Better…you know it without anyone saying!